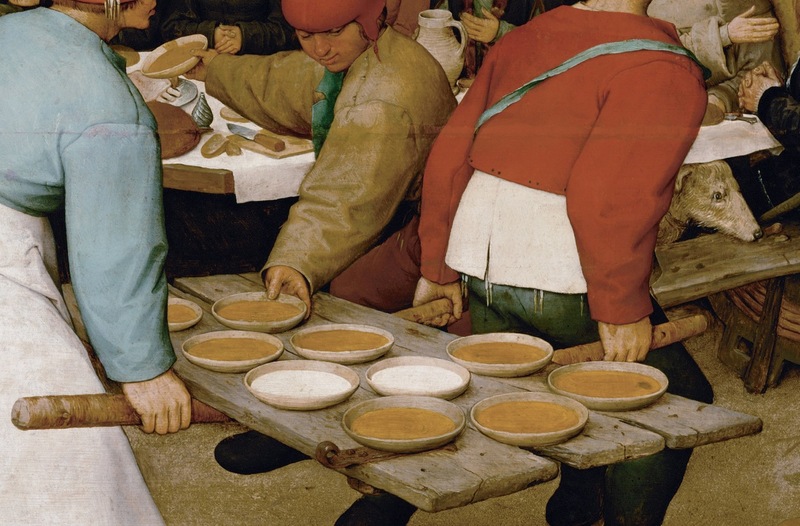 Pieter Bruegel the Elder, The Peasant Wedding, 1567, 114 x 164 cm, Oil on panel, Kunsthistorisches Museum, Vienna. As artists we continuously chew on what has already been digested. We repurpose, augment, regorge and attempt the performance of authenticity. We participate in a collective process of cultural digestion and regurgitation, a cannibalistic cycle of consumption and production. If we participate in this metabolic process, whose life are we sustaining? The production of thought and art forms a confusing and unwieldy body of gestures, mouthfuls, and tastes. We reflect on the process of digestion within this intellectual body and our collective material body of intellect. In this cannibalistic process, do we consume our selves? And, how can we sustain our own lives without getting consumed by the struggle to get by as artists? During their residency at SYB Sabrina Chou and Micha Zweifel will converse, digest, metabolize and cook together with guests, texts, objects, conversation and stews. On Wednesday, 21st of November, at 18:00 there will be the first dinner at Kunsthuis SYB. We will be in the company of artist and chef Rei Kakiuchi and writer and editor Matthew Stadler, who will join us in preparing the meal we will share together. What is the metabolic relation that we enter as artists/writers/citizens with our surrounding world? How do we take, consume, digest, transform, and give back to our aesthetic, political, and social surrounding? Places are limited, so please RSVP to amouthforastew@gmail.com or (0)634581089 by the of 20th November to reserve your seat. In case you cannot join us this time, we will also hold another dinner at the beginning of December. Dinner is free and a part of our residency project “A mouth for a stew”. Born in Osaka Japan (1969), lives and works in Rotterdam. Rei Kakiuchi studied Fine Art at Kyoto Seika University, Japan. In 2013 he completed a postgraduate program at Dutch Art Institute (DAI), the Netherlands.